Nacreous Clouds over Antarctica Imaged by Cherie Ude at McMurdo Base in 2004. 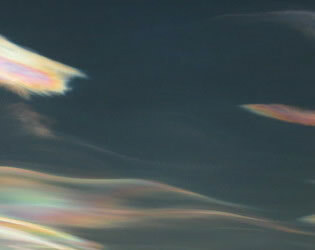 Nacreous clouds (Type II PSCs) glow brightly with vivid iridescent colours. They are wave clouds and their undulating sheet-like forms reveal the winds and waves of the stratosphere. ©Cherie Ude, shown with permission. They are seen mostly during winter at high latitudes like Scandinavia, Iceland, Alaska and Northern Canada. Sometimes, however, they occur as far south as England. They can be less rare downwind of mountain ranges. Elsewhere their appearance is often associated with severe tropospheric winds and storms. Nacreous or ordinary iridescent clouds? 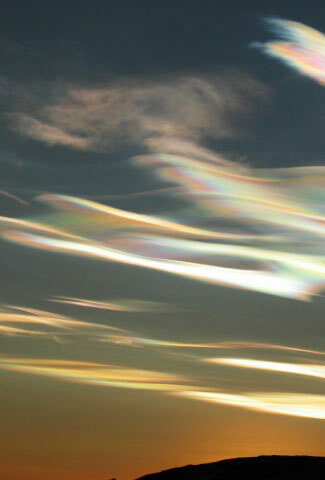 Lower level iridescent clouds in the troposphere are far more common and are seen all over the world. 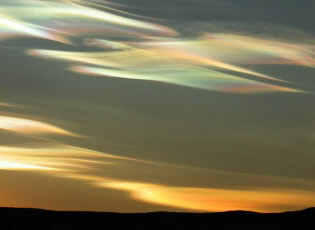 Nacreous clouds far outshine them and have much more vivid colours. The differences are highlighted on this page.